The Premier League is celebrating its 25th year since its inception and Chelsea have been present for every one of them, going on to claim the title five times. Here’s a look at the best of the players to don the famous blue shirt in the PL era! Arriving from Rennes for £7m in 2004 and standing at 6’5 Cech was an imperious figure for opposing strikers. Four PL titles, four FA Cups, three League Cups, one Europa League and a Champions League trophy found themselves in the gloves of Chelsea’s most decorated goalkeeper. ‘Super Dan’ signed for Chelsea in 2005. An attacking full back who occasionally operated further forward, Petrescu was one of the first of a new look, cosmopolitan Blues side. He departed in 2000 having contributed 17 goals from right back, an FA Cup, League Cup, UEFA Super Cup and UEFA Cup Winners Cup. Five PL titles, five FA Cups, three League Cups, one Champions League trophy and one Europa League. Captain. Leader. Legend. 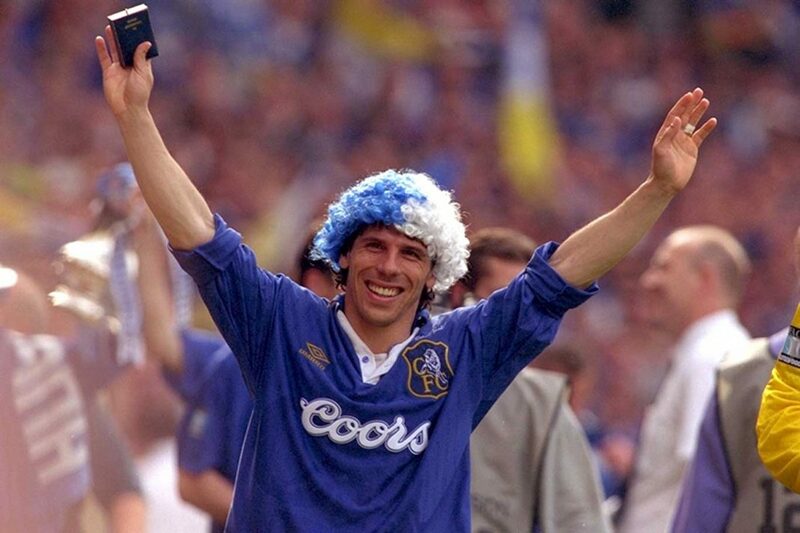 Brought to the club in 1998, the former Marseille and AC Milan defender was a real coup for Chelsea. One of the most accomplished defenders of his generation, ‘The Rock’ was strong and aggressive, a leader at the back and excellent on the ball. Lesser players won a PL title at Chelsea, but he still claimed an FA Cup and UEFA Super Cup for his CV. Arguably the greatest PL left back. Remarkably consistent even when regularly lined up against some of the greatest players in the world, Cole was tenacious, snapped in to tackles and still found time to cause the oppositions full back problems. A metronomic presence on the left flank. Helped Chelsea to a PL title, four FA Cups, one League Cup, a Europa League and a Champions League trophy. Signed by Ruud Gullit for a then club record £4.9m in 1996, Di Matteo represented Chelsea’s increased profile and the clubs resurgence in the late 90’s. An Italian international with pinpoint passing ability and an eye for a spectacular, long range strike, Di Matteo won the FA Cup twice, scoring memorably in both finals. Lampard signed for a bargain £11m in 2001, leaving 13 years later as Chelsea’s record goalscorer. His goal tally reached double figures in the league for a remarkable ten consecutive seasons. One of the greatest midfielders of his generation, Lampard was typified by his impeccably timed runs in to the box, his work rate, vision and extraordinary range of passing. His record of three PL titles, four FA Cups, two League Cups, a Europa League and Champions League is testament to his standing as one of Chelsea’s greatest ever players. A club record signing when Chelsea paid Wimbledon £1.6m for him back in 1990, Wise went on to become one of the most influential character’s in Chelsea’s formative Premier League years. Becoming club captain in 1993, Wise’s combative presence in the middle of the park, quickly made him a fan favourite. 445 appearances, 76 goals, two FA Cups, one League Cup, a UEFA Super Cup and Cup Winners Cup later Wise’s name is still sung at Stamford Bridge today. For many people the most talented player to have ever graced the pitch at Stamford Bridge. Regularly seen terrorising PL defenders with his silky footwork and guile. Blessed with a magnetic touch, burst of acceleration and speed of thought, Hazard is so often the key to the lock of the most stubborn defences. Two PL titles and counting for the Belgian wizard. He wasn’t called The Little Magician for pulling rabbits out of his hat! Signed from Parma for £4.5m in 1995, Zola was one of the raft of continental players brought to the club by Ruud Gullit. He immediately ingratiated himself to the Chelsea faithful with some outstanding performances and memorable goals. The way he dazzled the Man Utd defence to slot past Peter Schmeichel and his flicked near post effort against Norwich are moments of magic that still delight today. In 2003 he was voted Chelsea’s greatest ever player and his hallowed no.25 shirt has not been fit to grace another since. Brought to the club by Jose Mourinho back in 2004 for an outlay of £24m, Drogba proved to be worth every penny. A perfect blend of brute strength, pace and deadly finishing saw the Ivorian rack up 100 PL goals. He won the PL Golden Boot in 2006-07 and 2009-10 and led the line in four PL title winning campaigns. Previous articleWhat Formation Will Chelsea Play This Season?